Voltaire relished a good fight. But while the passions that would be invested in the Calas and La Barre affairs were to leave little room for feelings of amusement, when it came to Jean-Jacques Le Franc de Pompignan the target was ripe, the personal risk was low, and never was Voltaire in such fully gleeful form as during the years 1760-1761. He was safely settled; the exasperating conflicts with Frederick II of Prussia were well behind him; after the resounding triumph of Candide, he had the satirical wind in his sails, and he ran with it. For all of this, Le Franc had no one but himself to blame. Bolstered by his election to the Académie française, on 10 March 1760 he delivered an inaugural discourse of rare arrogance, posturing as France’s religious antidote to the ascending philosophes in French culture and in the Académie itself (he all but named Voltaire and D’Alembert), all the more so that he saw himself as God’s poet, his chief claim to fame being a series of editions of his Poésies sacrées, adaptations of Biblical psalms and other texts. Le Franc, a provincial magistrate, was really in every way insignificant except as a self-ordained symbol of reaction. Title page of Les Quand (Geneva [Paris], 1760), an edition printed in red ink. Voltaire perceived his target perfectly and struck with exquisite precision. He refers repeatedly and perversely to Le Franc’s earlier (as he calls it) Prière du déiste, which is nothing but a French translation of Pope’s Universal Prayer. From Le Franc’s Mémoire présenté au roi, published in May, he concludes (quite rightly) that Le Franc wanted to wrap himself in pious royal protection, headily aspiring even to the dignity of royal governor. Le Franc repeatedly exposed himself in every way to Voltaire’s wilting barrage, and surely rued the day he saw fit to allude to ‘ma naissance et mon état’, every syllable of which gave Voltaire purchase to sink his claws deeper into ‘le seigneur de Montauban’. Whereas Les Quand, which launched the serial attack, rhetorical indictment, the flurry of ‘monosyllabes’ (so named because many were based on single-syllable anaphoras, beginning with quand, qui, etc.) that followed – anonymous all, of course, if not pseudonymous – was more pointed. There seemed to be broadsides sprouting up everywhere, and they were intended to be recopied, by press or by hand, ad libitum, so much so that their proliferation stretches the limit of what an ‘edition’ is; even their order of appearance is hard to sort out. 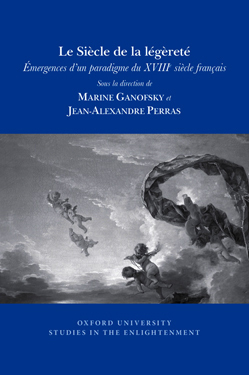 André Morellet chimed in with his own Si, Mais and Pourquoi, and in September these, along with several other pieces joined the bulk of Voltaire’s satirical productions of 1760 and were assured a certain fixity in the Recueil des facéties parisiennes pour les six premiers mois de l’an 1760. 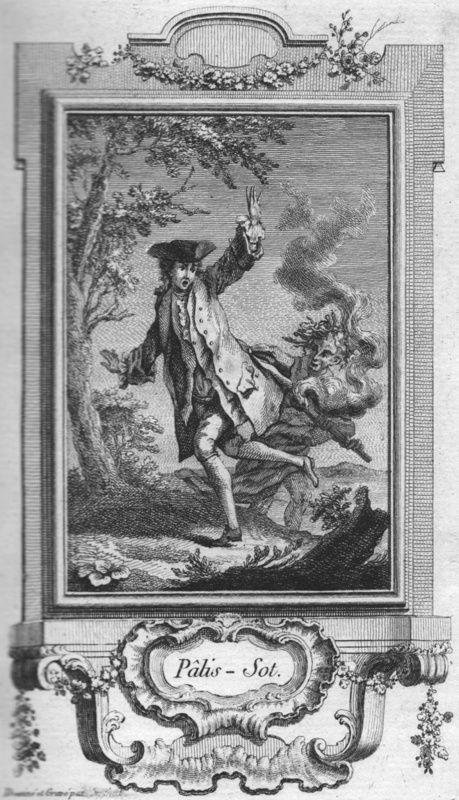 Engraving of Palissot, pursued by a wraith-like Voltaire. The caption mocks his name. The dramatist Charles Palissot de Montenoy must have thought that Le Franc’s star was rising – when it was about to go down in flames – and more or less hitched to it his comedy Les Philosophes. The play upped the stakes for the philosophes: Le Franc just made people laugh at him, Palissot made them laugh at the philosophes. A Voltaire didn’t have to worry much about the Académie, but the Comédie-Française was another thing entirely, and raised the spectre of persecution. With Le Russe à Paris he broadened the attack to include such other enemies as Maupertuis and numerous religious polemicists and ‘sponsors’ of Palissot’s. It took a year for the rage on both sides to subside, and by then the balance was about to tip dramatically in the philosophes’ favour. Volume 51A of the Complete works of Voltaire publishes Voltaire’s interventions in the literary quarrels of 1760, both his own original pieces, and his annotated or abridged versions of texts by other participants. Émilie du Châtelet, forgotten encyclopédiste? 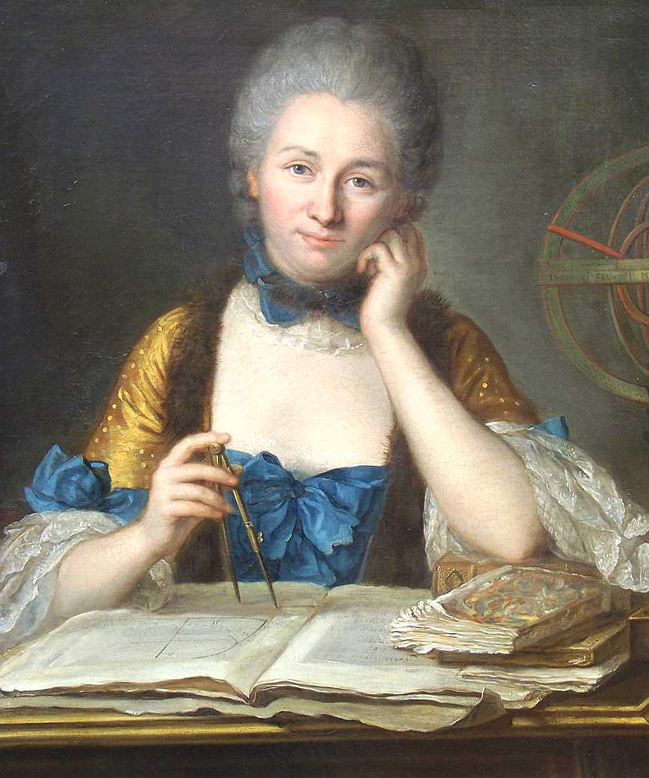 Émilie du Châtelet was a great many things: mathematician, natural philosopher, translator of Newton, successor of Leibniz and Wolff, lover and scientific companion of Voltaire, and various other sundry pursuits. She was not, however, nor is she today, widely considered as a contributor to the Encyclopédie. No mention of her is made in either D’Alembert’s “Discours préliminaire”, or in any of the other “Avertissements & Errata” paratexts that accompanied the Encyclopédie’s publication. Logically then, she is also not to be found in any of the exhaustive lists and inventories of encyclopaedic authors compiled by later scholars such as Richard Schwab and Frank Kafker. This accepted wisdom, however, is now being brought into question thanks to renewed interest in Du Châtelet not merely as a translator, commentator, or companion of great men, but equally as a significant intellectual force in her own right. Recent scholarship such as that by Koffi Maglo has succeeded in challenging what had for centuries been assumed as Du Châtelet’s decidedly minor role in the encyclopaedic enterprise. More recently still, an international group of scholars came together in Oxford this past May for a study day on the subject of “Émilie Du Châtelet: Philosopher & Encyclopédiste”, a workshop aimed at unravelling Du Châtelet’s complicated and often overlooked encyclopaedic legacy. We now know, for instance, that the unsigned article “Hypothèse” is largely drawn from Du Châtelet’s Institutions de physique (1740). Indeed, “Hypothèse” is one of seven articles that explicitly cites the Institutions de physique as a source. And, of these seven articles, “Hypothèse” is the only one that is not at least partially authored by Samuel Formey. Formey, it would seem, is largely responsible for Du Châtelet’s inclusion in the Encyclopédie, so much so that, according to Maglo, if one follows “les traces de Formey […] vous serez en compagnie de Mme Du Châtelet”. However, Formey’s role in the Encyclopédie is somewhat curious. An exiled Huguenot pastor and perpetual secretary of the Prussian Academy of Sciences in Berlin, Formey had begun his own philosophical dictionary as early as 1742. 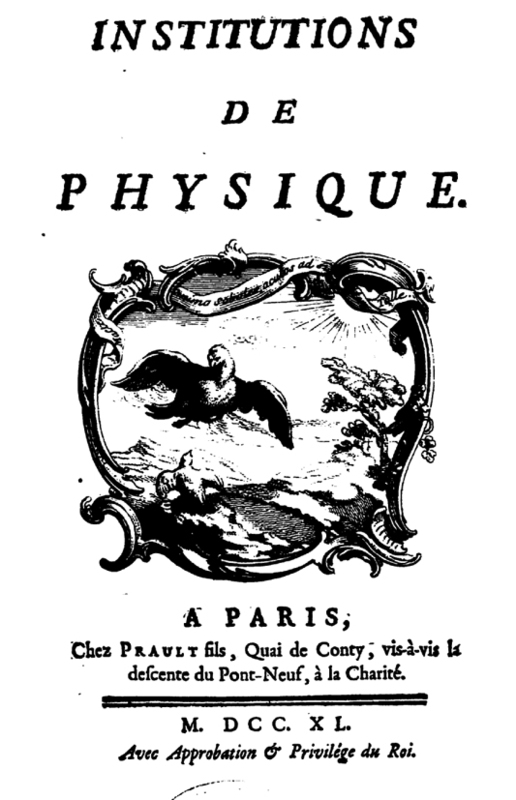 By 1747 he had heard rumour about a French encyclopaedia project – which took as its starting point a translation of Chambers’ Cyclopaedia – and decided to approach its editor, then the Abbé Gua de Malves, offering his completed articles to the new enterprise. By 1749, the deal – executed by the libraires associés who controlled the project – was finalised, and Formey sent the editors (by then Diderot and D’Alembert) some 1800 manuscript pages (petit in folio) in exchange for 300 livres; with the added proviso that the manuscript be returned to the author and that he be mentioned in the work’s preface. 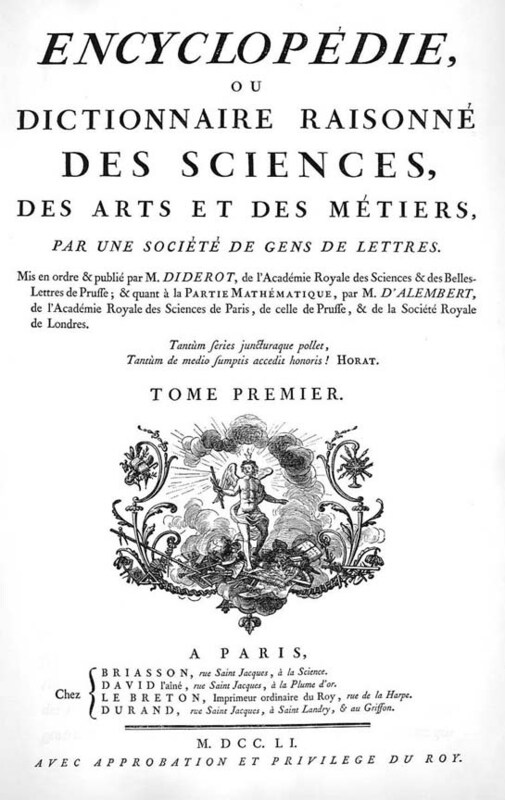 It is thus presumably through the mediation of Formey’s articles that Du Châtelet’s Institutions de physique (one of Formey’s admitted sources for his articles on Metaphysics) came to be incorporated into the Encyclopédie. As such, most scholars have treated Du Châtelet as a secondary source for the Encyclopédie, and little more. But, digging into the issue a little, it would seem that the Du Châtelet/Formey relationship is rather more complex than we normally assume. Is this really just a simple case of an author (Formey) using a source (Du Châtelet) in order to bolster an argument or expand upon a concept? Or, as with “Hypothèse”, is there more to Du Châtelet’s presence in the Encyclopédie than we’ve previously admitted? To answer these questions I compared a copy of the Institutions de physique found in the BNF’s Gallica digital library to the entire text of the Encyclopédie using a sequence alignment algorithm developed by the ARTFL Project. The results, which will be published in full later this year, not only give us a better understanding of the extent to which Du Châtelet was used in the seven articles that cite the Institutions de physique, but also reveal a further six articles that make extensive use of Du Châtelet’s text with no attribution at all. Given both the scope and scale of these borrowings, whether cited or not, these new findings serve to complicate further the already nebulous notion of authorship in the Encyclopédie. Take, for example, the article “Contradiction”, attributed unequivocally to Formey by Diderot and D’Alembert: “Cet article est de M. Formey”. Of its 338 words, 320 of them are drawn directly from sections 4 and 7 of the Institutions de physique, again with no attribution. To put this into terms perhaps more familiar to modern academic sensibilities, this means that Formey’s Turnitin-style “similarity score” for the article “Contradiction” would register at a rather alarming 95%. Indeed, all of the Formey articles we examined would score well above the 50% originality metric in terms of their similarity to Du Châtelet’s text. Nor was this practice limited to Du Châtelet, apparently, as Alexander Bocast has convincingly demonstrated. Formey also makes quite liberal and unacknowledged use of Condillac’s Essai sur l’origine des connaissances humaines in his article “Définition”, for example. All of which inevitably begs the question: should we continue to attribute articles to Formey that are drawn primarily from other sources? If not, to whom should we attribute them? Formey and Du Châtelet (or Condillac) together (in what order? ); or Du Châtelet (and Condillac) alone, if above a certain threshold of borrowing? At what point does an article “belong” to its author as opposed to its source? And, on what grounds should one make these sorts of editorial decisions at all? These questions all speak to the unique dialogical structure of the Encyclopédie and its multiple layers of authorship and authority. Contributors (both acknowledged and anonymous) would weave outside sources into their articles with varying degrees of attribution. These contributions would then often become the subject of editorial interventions on the part of Diderot and, to a lesser extent, D’Alembert. All of which makes the Encyclopédie a fundamentally “social” text, one built on the premise of philosophical conversation between the various members of Diderot’s “société des gens de lettres”, a microcosm of that larger international “Republic of Letters”. Émilie du Châtelet was unquestionably a leading citizen of this Republic. And, while her contributions may be obscured by their apparent status as secondary source, new research such as that presented here is beginning to deconstruct this primary/secondary distinction in favour of a more expansive, and dialogical notion of encyclopaedic authorship. If Montesquieu is unambiguously considered as one the encyclopédistes thanks to his “contribution” of a single, unfinished posthumous article (e.g. “Goût”), then can’t we imagine an expanded author list for the Encyclopédie that makes room for Émilie du Châtelet, and doubtless many others? I, for one, would hope so. But while we collectively might not yet be prepared to grant Du Châtelet full status as an Encyclopédie author (though I would argue that we should be), then, at the very least, we should do our best to make sure that she’s an acknowledged – and significant – participant in the philosophical conversation that the Encyclopédie enacts. See Richard N. Schwab, Walter E. Rex and John Lough, Inventory of Diderot’s Encyclopédie (Studies on Voltaire and the Eighteenth Century, vol.80, 83, 85, 91, 92, 93 and 223, Oxford, 1971-1984) and Frank Kafker, The Encyclopedists as Individuals (Studies on Voltaire, vol.257, Oxford, 1988). 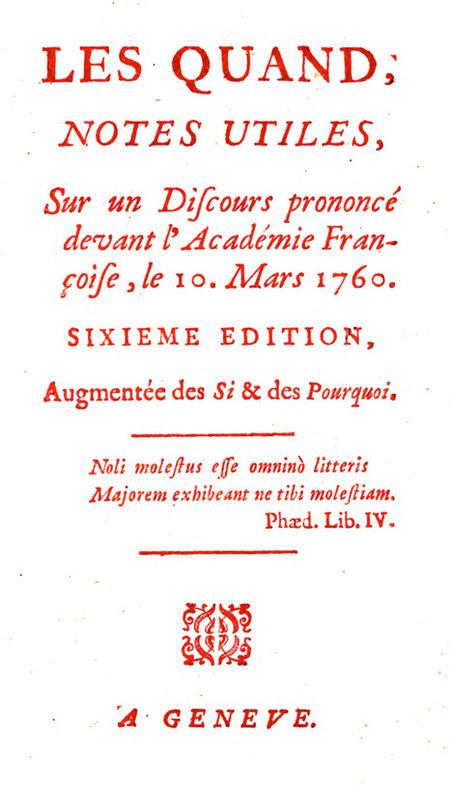 See Koffi Maglo, ‘Madame Du Châtelet, l’Encyclopédie et la philosophie des sciences’, in Emilie du Châtelet: éclairages et documents nouveaux (Paris, Ferney-Voltaire: CIEDS, 2008), p.255-66. This is the same methodology, in fact, that we used previously to examine the citation practices of the encyclopédistes. See Dan Edelstein, Robert Morrissey, and Glenn Roe, “To Quote or Not to Quote: Citation strategies in the ‘Encyclopédie’”, Journal of the History of Ideas 74.2, April 2013, p.213-36. See Bocast, “Condillac’s Contributions to Formey’s Article on ‘DÉFINITION’ in Diderot’s Encyclopédie”. Le Roi dans son lit de parade tel qu’il y parut le premier de septembre jour de son décès 1715 (BnF). Le château de Versailles présente du 27 octobre 2015 au 21 février 2016 Le roi est mort. Louis XIV 1715. 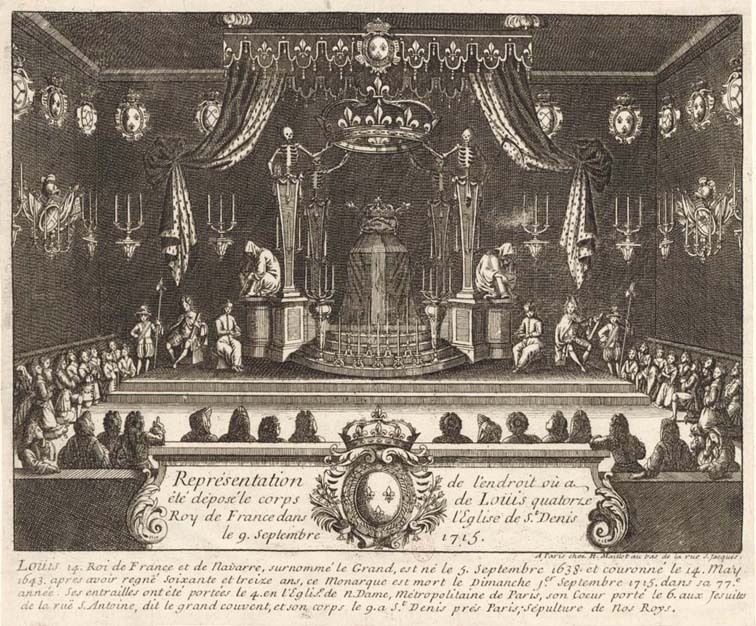 Commémorant le tricentenaire de la mort de Louis XIV, cette exposition, placée sous le commissariat de Béatrix Saule, directeur-conservateur général du musée national des châteaux de Versailles et de Trianon, et de Gérard Sabatier, professeur émérite des Universités et président du comité scientifique du Centre de recherche du château de Versailles, entend donner à voir et à comprendre un rituel méconnu: celui des funérailles du Grand roi, de son exposition à Versailles dans sa chambre mortuaire le 1er septembre 1715 à son inhumation dans l’abbaye de Saint-Denis le 23 octobre suivant. Ces obsèques marquaient l’aboutissement, en même temps que le profond renouvellement, d’un cérémonial séculaire, qui allait devenir une des plus éclatantes manifestations de la civilisation de cour. Des funérailles royales françaises, on ne retient généralement que les proclamations du héraut d’armes lors de la mise au tombeau de la dépouille: le roi est mort, vive le roi, officialisant le décès du défunt et l’avènement de son successeur, adage de la monarchie qui ne meurt jamais. Le rituel lui-même n’avait pas retenu l’attention des historiens car il n’avait pas de contenu politique, les aléas de la transmission du pouvoir étant réglés avant le décès, selon le principe lignager de la primogéniture masculine. A la fin du XVème siècle et jusqu’en 1610, l’écart entre le décès et l’inhumation fut considérablement dilaté par l’adoption de conduites honorifiques nécessitant l’utilisation d’une effigie tenant lieu du cadavre imprésentable, et de procédures imitant celles des funérailles des empereurs romains. Ce parasitage cérémoniel retardant l’instantanéité de la transmission de pouvoir fut abandonné par étapes sous la pression des circonstances pendant la période des guerres civiles à partir de 1560, et la forme triomphale des funérailles des Valois fut réfutée par Louis XIII en 1643. Cependant, loin de disparaître, les funérailles royales françaises connurent sous les Bourbons une mutation que cette exposition se propose de montrer et d’expliquer. Représentation de l’endroit où a été déposé le corps de Louis quatorze roi de France dans l’église de St. Denis (BnF). Exposition-événement, c’est la première de ce genre en France, ce qui s’explique par l’attitude précédemment évoquée des historiens, et la quasi absence de documents directs, décorations, accessoires, iconographie même. Les musées français, espagnols, allemands, anglais, suédois, américains ont permis toutefois de rassembler d’importants tableaux, certains jamais montrés, des instruments chirurgicaux, des accessoires de deuil, des pièces originales du trésor de Saint-Denis, tout l’apparat du dernier cérémonial funèbre , celui de Louis XVIII. Des archives proviennent le testament et le rapport d’autopsie de Louis XIV. Grace à une abondante documentation textuelle, Pier Luigi Pizzi a pu pallier l’absence de témoignages originaux par une muséographie très évocatrice. Le séquençage suit une progression chronologique en neuf étapes. Marche et Convoi funèbre de Louis le Grand, Roi de France (BnF). 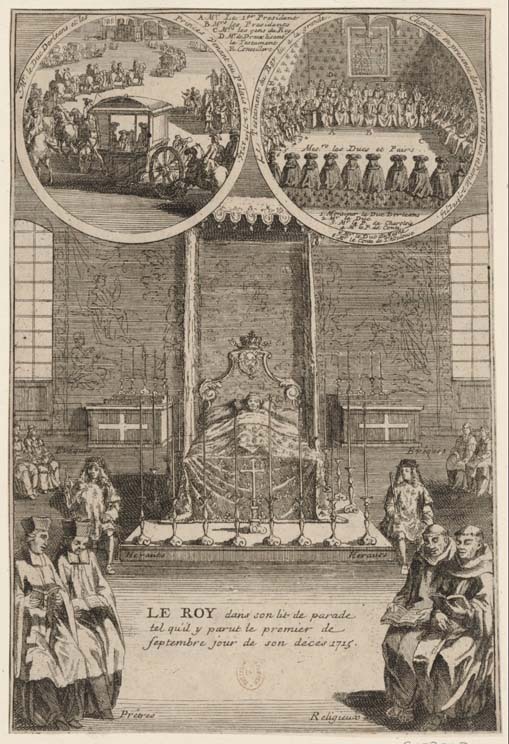 Ce roi qui disparaît est une sélection de tableaux, de gravures, de médailles d’or ou de médaillons de bronze qui pouvaient contribuer à produire, chez les contemporains, une figure du roi, un imaginaire de Louis XIV, dans son ambivalence entre lumières et ombres. Louis se meurt rapporte les trois semaines où le roi fit face à la maladie puis organisa théâtralement sa mort, veillant au souvenir qu’il laisserait. Des extraits de Si Versailles m’était conté et de L’Allée du roi présentent la mort cinématographique de Louis XIV. Ouverture et embaumement est une séquence réaliste qui permet de découvrir une des pratiques les plus étranges des funérailles royales: l’ouverture du corps, le prélèvement des entrailles et du cœur, l’embaumement permettant une présentation supportable. Exposition et effigie montre trois modes de présentation des monarques défunts pour recevoir les hommages et les prières, selon qu’on a à faire aux Valois, aux Bourbons ou aux Habsbourg. Le deuil à la cour. Les funérailles royales sont un moment essentiel dans la vie des courtisans. La réglementation minutieuse des pratiques du deuil est l’occasion de rendre visible la hiérarchie des rangs qui structure cette société, exprimée notamment par les types et les couleurs des vêtements. Le convoi funèbre. Autre grand moment des funérailles royales, le plus important peut-être au XVIème siècle, lorsque le cortège réunissant tous les corps de la société autour du défunt traverse la capitale. Les Bourbons depuis Louis XIII procèdent différemment. L’exposition montre précisément et explique cette nouveauté souvent mal interprétée. Les services à Saint-Denis, en France et à l’étranger. Présentation des pièces du trésor, reconstitution des placements, évocation de l’apparat surprenant d’une église transformée en salle de spectacle. 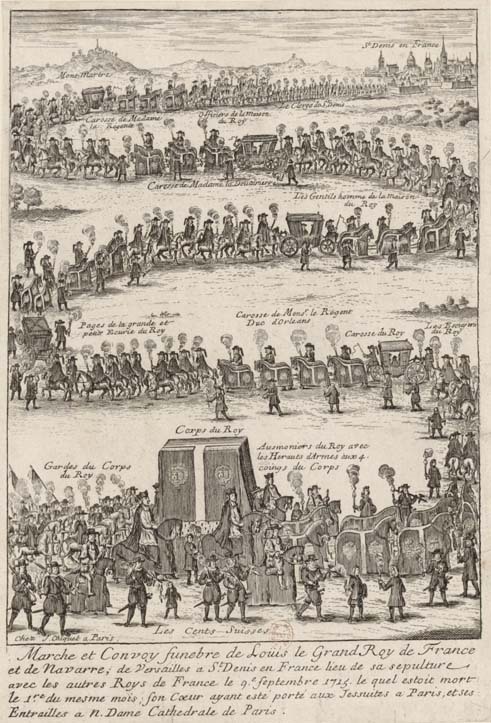 Mais les funérailles de Louis XIV ne furent pas seulement célébrées dans la nécropole royale, des services commémoratifs se tinrent partout en France, et jusqu’en Amérique, sur ordre de son petit fils Philippe V.
Tombeaux et mausolées. Un des mystères des funérailles des Bourbons. Alors que les Valois avaient faits construire de prestigieux monuments funéraires, leurs successeurs rompent avec cette tradition, ne menant pas à terme les projets architecturaux dont on présente les plans, se contentant de simples cercueils alignés dans la crypte. Par contre, ils accordent tous leurs soins à l’ensevelissement de leurs entrailles et surtout aux tombeaux de leurs cœurs. Les vrais monuments funéraires des Bourbons furent cependant les apparats éphémères, les mausolées dressés partout dans les églises, dont on trouvera plusieurs feuilles de dessin. Des funérailles royales aux funérailles nationales. L’exposition s’achève sur les héritages d’une pratique monarchique que la Révolution avait voulu détruire, la recherche d’une nécropole autre que Saint Denis, la remise en honneur des grands cortèges avec les hommages populaires. Les tableaux officiels des funérailles des présidents de la république s’inscrivent dans une continuité éloquente. La thématique retenue permet d’évoquer les obsèques royales sous leur aspect politique, social et culturel, situant un rituel que l’on pourrait croire obsolète au cœur d’un imaginaire du pouvoir au-delà des ruptures historiques. Le deuxième tome du Siècle de Louis XIV (chapitres 13-24) (Oxford, Voltaire Foundation), est maintenant disponible.